I’m going to treat this album as though it fell into two distinct sections. For me it does. 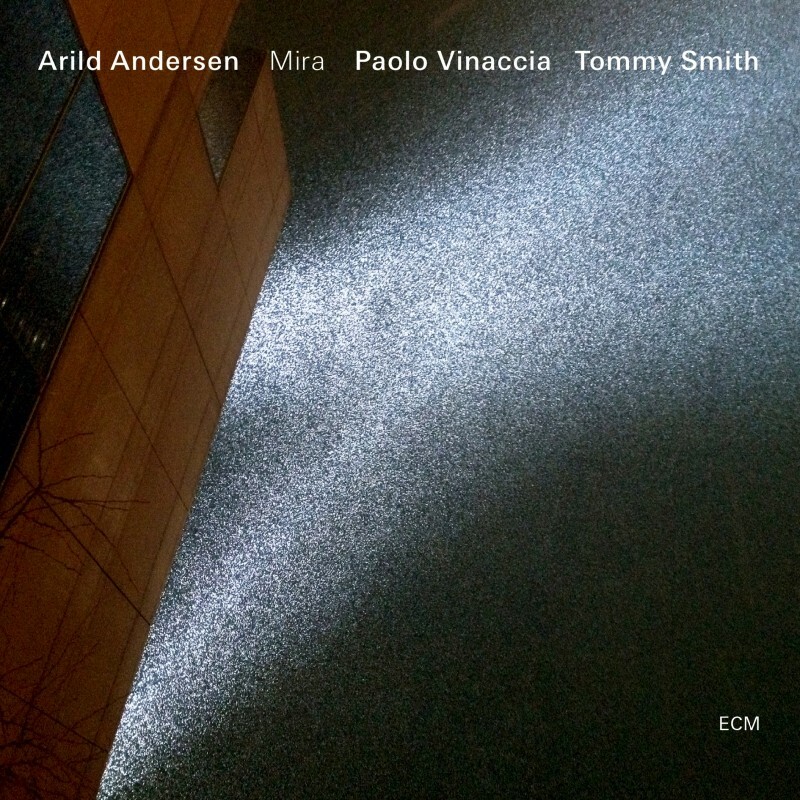 Two thirds of Live at Belleville (ECM), the earlier release by Arild Andersen’s trio with Tommy Smith and Paolo Vinaccia, was given over to the four-part “Independency” suite. Two further Andersen originals and Duke Ellington’s “Prelude to a Kiss” comprised the final third. The information accompanying Mira, the group’s first studio release, indicates no suite-like aspirations, but the new album similarly divides into two parts: a trio of emotionally direct tunes including Burt Bacharach’s “Alfie”; then a clutch of gnomic tone poems aglow with ambivalence. Of the first three pieces, it is ironically Andersen’s “Bygone” that seems most closely to fit the mould of a jazz standard. One for the books, then; or more specifically, for the Great Norwegian Songbook! Following ECM’s trademark five seconds of introductory silence, this opening tune unhurriedly establishes the album’s dominant mood of resignation. Emotionally direct, yes, but these initial pieces are far from extrovert. As Tommy Smith’s tenor dispatches the melody of “Bygone”, his tone ranges from plaintive to caressing. Elsewhere in his varied catalogue of recordings, one spots the Scottish saxophonist summoning any amount of bluster and astringency; but here and throughout Mira his tone implores more than it exhorts, held delicately aloft by the minimalist drumming of Paolo Vinaccia, an Italian relocated to Andersen’s native Norway and a long-time member of the bassist’s bands. Much like ECM’s virtual European house drummer Jon Christensen, Vinaccia weaves subtly insistent cymbal patterns alongside sparse comments on snare, toms and kick drum. Smith navigates the resultant tapestry like the proverbial walker on eggshells. While the three musicians occupy equal portions of the crystal-clear stereo picture, there is no question who’s boss—or at least band leader. Besides claiming most writing credits on Mira, Andersen asserts himself more vigorously than even most bassists in trio settings. After that initial statement of melody, he turns “Bygone” into a stage from which his instrument calmly yet authoritatively compels the audience to accept the album’s commitment to understatement. The orator’s message seems to run as follows: things will not get out of hand; solos will never be more demonstrative than this one! Indeed, Andersen’s solo is a marvel of measured construction, counseling forbearance until Smith’s tenor restates the melody. The next two pieces complete the initial triptych with contrasting moods. Neither departs from the low- to mid-tempo template, but “Blussy” throws cheeky tenor swagger and caustic yet contained overblowing against a streetwise backbeat: certainly the most carefree playing on this record. On “Alfie”, Smith’s tone thickens to the size of Ben Webster’s, palming the famous theme in the low register before moving to midrange to release it wryly like a butterfly. Another patient Andersen solo suggests sympathy for the eponymous rake, and Smith closes the tune alongside the bassist’s arco peroration. On both these tracks, and throughout the whole album, the instrumentalists are beautifully defined and distinct, recognizably interactive yet each seemingly enclosed in a crystalline cocoon preserving his every expressive gesture with utmost fidelity. Whereas Live at Belleville capitalized on the freewheeling frissons of live performance, Mira basks in the carefully crafted ambience of Rainbow Studio, Oslo, the space most closely identified with the clinically atmospheric ECM sound. As Rainbow’s resident engineer, Jan Erik Kongshaug is the man most responsible for that sound. (Label boss Manfred Eicher’s name of course stands synonymous with the rarified curatorial concepts underlying the label’s influential ethos.) On Mira, Konshaug honours the musicians’ efforts to avoid grandstanding, faithfully committing to disc their more elusive ruminations. With track four, the listener crosses a threshold into a land of non-committal half-light. The music remains tonal and melodic, but the gestures are smaller and cryptic, without the catchy thematic hooks suggestive of standards repertoire. On this piece, “Rossetti”, Vinaccia sets up a rhythm of chattering rimshots over which Smith intimates a crisply neoclassical theme. For the rest of the album, the tartan tenorist’s tender asperity recalls the keening tone of his Nordic counterparts Tore Brunborg and Jan Garbarek. The brief “Raijin”, credited to the saxophonist and drummer, extends this tone in an explicitly eastern direction. Here Tommy Smith lays down his horn and takes up the shakuhachi, while Vinaccia single-mindedly summons an enormous ceremonial drum sound. “Kaijin” is all shakuhachi, ninety seconds of Smith’s solo musings on bamboo flute. If you were to consider the album’s second portion a suite unified by distinctive sound traits, the tunes “Reparate”, “Mira” and “Stevtone” could comprise a suite within a suite. Though non-consecutive in running order, they coherently enshrine the musical earmarks of an aloof sensibility, disinclined to emote. On “Reparate”, the first thing you notice is the ambient electronics, coolly distancing the impact of Andersen’s artistry as his fingers stipple the Nordic air with pizzicato flurries. “Mira” opens with further lonely ruminations from the bass boss, before the saxophonist makes his own case for detachment. Neither cheerful nor disconsolate, Smith’s notes hang in a state of emotional equipoise. Vinaccia’s deep toms predominate on “Stevtone”, an aptly non-committal closer that shortly evaporates behind the veil of Andersen’s electronics. Now let me come clean: on first listen to this disc I was underwhelmed. The hurly-burly of Live at Belleville made the equivocal proceedings on the newer album sound pallid. But so much for first impressions: after several listens, those same proceedings captivate with their quiet drama; I now adore this record. Unless you require aural reinforcement of some particularly strong emotion, I recommend that you feast your speakers on Mira. She’s a beauty. Editor’s note: This recording is recommended, and Wall of Sound encourages its readers to buy from a local, independent record store whenever possible. If you have no local option, please consider supporting our website by ordering from Amazon using our Affiliate link: Arild Andersen – Mira. Thank you!